Just a couple of blocks down from the Tacoma Dome, you’ll find a gigantic building with interesting shops. It’s like a mall, if malls had people in them that cared about working there. Freighthouse Square has always been a place for artistic or creative sorts to sell their stuff. It has gone through many changes over the years. The one thing that hasn’t changed is that there are people passionate about the place. Tamara Clammer is one of those people. She’s put together something called the I CAN! Celebration and I think it’s something readers will be interested in. 1. What is the I CAN! Celebration? I CAN ! is a free, family-oriented, interactive arts event on Saturday, March 31st in the Rainier Room and some of the currently available spaces at Freighthouse Square. This event is being created by the community, for the community, by combining resources that are already available within the community. My primary goal is to help revitalize Freighthouse Square while simultaneously creating a way to interact with artists and crafters that focuses on inspiration and the creative process rather than just admiring and purchasing a finished product. My secondary goal is to test the theory that an exciting event can be created with little or no budget simply by gathering together and each of us providing a bit of what we have to offer. Many of Freighthouse Square’s merchants and local artists are joining together, and we are hoping you will join us, too. City Blocks will be setting up a large LEGO sculpture and an interactive LEGO and DUPLO building area as the centerpiece for this event. Lucy Schwartz from the Freighthouse Art Gallery will be teaching watercolor painting demos. Just Sage will Emcee and perform a set of comedic magic. Heidi Stoermer will be singing and playing acoustic music. Ryan Henry Ward will be storytelling and painting. Dayton Knipher will share her artistic photography with us and explain how to get the best results from a digital camera. Sharon McBride will be reading Tarot. Suni Cook Boucher will share her talents for creating beautiful artwork from items that might otherwise be recycled or, worse, thrown away. Brown Paper Tickets will be sponsoring a Scavenger Hunt that will explore all of the merchants’ shops at Freighthouse Square. There will also be games of Giant Checkers, using the permanently installed dance floor and traffic cones. Boxcar Grill will be catering the green room for our participants. And, www.NorthwestAuthors.org will be joining us at Freighthouse Square for their Spring Book Fair. They will share the stage with us to read excerpts from their works. Other artists may be joining us for live painting during the event. 2. 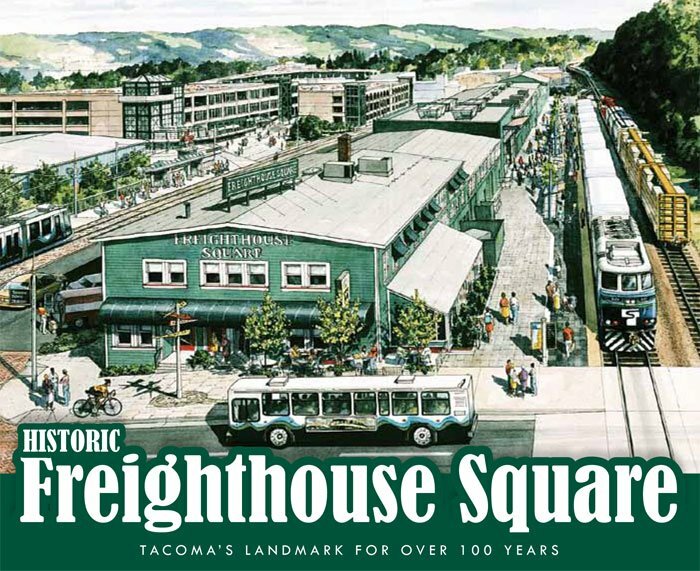 What is your first memory of Freighthouse Square? I first came to Washington in 1987, when I was stationed at Fort Lewis. Growing up in a town of 300 in the cornfields of Illinois, Freighthouse Square was my first real exposure to diversity, arts, culture and the first real sense of community. This is where I tried my first Indian, Greek, Vietnamese, German and Filipino foods, where I saw stiltwalkers in real life at a Mardi Gras event in the food court, where I first discovered the artwork of Jody Bergsma, metaphysical concepts and tools, artwork that was created by adults for the purpose of making art rather than students simply as a high school elective, and where I saw an entire room full of antiques that, along with the whistle and rumble of a train passing by, made me feel at home. I recognized plates that my grandma had, glasses from the 50’s that were my mom’s favorites, strange things, beautiful things, so many interesting things in one place that it was as if I’d entered a completely new and yet somehow familiar world. 3. Why did you start the I CAN! Celebration? In early January, I wandered through Freighthouse Square for the first time in several years and was initially disappointed to see that so many of the spaces were empty and that part of the building was closed off for repairs. After meeting Lucy Schwartz at the Freighthouse Art Gallery and talking a bit about what could be done to help, she provided me with the contact information for the new property manager, Lonee Peschon. While meeting with Lonee, we decided that a free community event would help bring new life and energy to the building. Not wanting to compete with the merchants by selling things, and not having a budget to work with, I began asking people if they would like to participate, pro bono, in an interactive community art day. I am able to put time, energy and passion into this project because I am a part of Brown Paper Ticket’s community service outreach program, called “the Doers.” My specialization is to do things to help the arts and the Maker community to grow and thrive. Through my job, I am free to be a force of positive change. While typing out a preliminary plan for the Freighthouse Square event, I abbreviated this as ICAD. My partner, Just Sage, said, “It’s too bad you can’t think of something that starts with N, because then it would be I CAN!” And so, the word Day was replaced with Network and the 1st Annual Interactive Community Arts Network (I CAN!) began to take shape. But what is the network, you ask? 4. What can people do to help? We still have room for more artists, crafters, and performers who are interested in providing hands-on experiences, whether it’s showing someone how to sculpt with clay, knit or crochet a scarf, weave a rug, spin yarn, needlefelt, turn an iPhone into a tabletop robot, entertain by breaking the 4th wall, or in whatever way someone might feel compelled to share what they make or do with the community. If you’d like to participate, please e-mail me at Tamara@BrownPaperTickets.com. People can also help us advertise I CAN by telling their friends and bringing their families. We’ll be open from 10am-4pm, and the schedule will be posted at http://www.brownpapertickets.com/event/231586 . They can also follow Freighthouse Square (Official) on Facebook for updates, and return to Freighthouse Square often to shop for gifts, eat lunch, or just relax and stroll through the Art Gallery. 5. What do you see for the future of Freighthouse Square? I see a lot of potential. I walk past the vacant storefronts but in my imagination I see a fruits and vegetables stand on the south end near Boxcar Grill. In the rooms along the way towards the food court I see a small fabric store that carries colorful bolts in fun patterns, yarn, knitting and crochet needles, notions, patterns, and classes to help get you started. I see a bookstore that specializes in the works of local authors with periodic readings and signings, and that offers workshops on how to get your own works published. Past the food court I see an antique shop full of dishes, jewelry, small furniture, and home décor that I recall from my childhood. I see a clothing consignment store where you can support your neighbors while selecting a new spring wardrobe. I see a joke and magic shop that entertains shoppers as they browse. I see a crystal shop with an intuitive healer. I see that there is a new German restaurant, and that they have marzipan in the display case. And further down the hall, I see Freighthouse Handmade, a Co-Op full of puppets, doll houses, scarves, masks, handbags, wooden train sets, upcycled cans that are now lighting fixtures, flowers and candle holders, cards, journals, candies, yard art, and jewelry made from watch parts. See you on March 31st! Update: I’ve been informed that Tacoma’s mayor, Marilyn Strickland is planning on putting in appearance at the I CAN! Celebration.